This week, we're hanging our heads in shame and admitting to the fact that we've not read ALL the popular authors! Try not to judge us too much. I KNOW! I'm not even going to justify these picks, because I know there is nothing I can say that will get me out of the doghouse. If it's any consolation, I own at least one book by each of these authors. I just need the time! Also, I've never read anything by John Green, but Jana beat me to it! Anyway, I've been debating about whether to read If I Stay, but I'm not very into tear-jerker-y things (also why I've never read any Jodi Picoult) but feel free to try to convince me otherwise. As far as John Grisham goes, I'm pretty sure I own a few of his books but haven't gotten around to reading them yet. I like thrillers, but I'm generally more into the supernatural-thriller genre than the scary-business-mafia-people-thriller genre. I'm actually embarrassed I've never read any Hinton. She pretty much started the whole "books written for teens" thing, plus she was a teen herself when she wrote The Outsiders. I feel like a bad teen librarian. Also, I've never read any Clare, which I feel like I should since she is so prolific and popular, but I've never really been too intrigued by her books. Maybe I would change my mind if I read one. What popular authors have you not read yet? Which ones should we start with? I had S.E. Hinton, too! Now I don't feel quite so bad, haha. As for which author to start with, I have to go with John Green. Book to read first: Looking for Alaska or The Fault in Our Stars. I pretty much haven't read any currently popular writers, since I have such dinosaur tastes and try to avoid book surrounded by massive hype. John Green is on my list too! I haven't heard of some of these Authors. Tahleen.. Please try Clockwork Angel... sometime.. anytime this year!! I haven't tried Hinton, Jodi Picoult or any of Jana's picks either but have read John Grisham. I usually pick up the popular authors after the hype has died down a bit. I haven't read John Green or Julia Quinn either, though I have read books by the other authors above. And I actually hadn't heard of the Julia Quinn, but I'll definitely have to check out her novels. I've only read one Jodi Picoult book, My Sister's Keeper, and I actually thought it was a bit rubbish. I won't be reading any more of her books! Jane Austen. Bernard Malamud. Terry Carr. Stephen King. Terry Brooks, William Styron, read John Grisham until he started with the brains and blood, Anne Tyler (no idea why, i have two or three of her books, just.never.got.there; Maya Angelou, (lets face it you have to try these sometimes to know why you dont read them), Dan Brown. A lot of it has to do with that sudden surge of popularity that some authors have, and everyone has to read the book because their best friend likes it. I tend to wait until the flurry is over or borrow a copy from someone. John Green made my list too. I didn't think of John Grisham, but that is another popular author I'd like to read one day. S.E. Hinton was one of my favs as a kid -- The Outsiders was so good! I've never read Grisham or Hinton either, though I'm sure I would enjoy both; especially Grisham because I love thrillers. Time is always a huge issue for me. If I were going to start with someone on this list it would probably be Clare. I would love to know what all the fuss is about. I personally wish I would have never wasted time reading Cassandra Clare. She has an incredible world that she created and her characters are pretty awesome too, but I cannot stand her writing and the storyline of, at least, TMI was awful. I certainly can't judge since I literally just finished reading my first John Green book last evening or he would have made my list. The Fault In Our Stars was exceptional, but be prepared to go through a lot of tissues. I really liked John Grisham's early books, but I haven't read any past the first 7 or so. Cassandra Clare is great as well. I just read a Gayle Forman book (JUST ONE NIGHT) and let me tell you it was fantastic. I also am a big John Green fan. Cassandra Clare is also on my list, and I haven't read anything by Grisham either (and I never really plan to). Great topic this week guys! Thanks! John Green and Jodi Picoult are must reads, in my opinion! I haven't read Ockler, Grisham, or Hinton either. But I'm surprised you've gone this long without having read Green or Clare! I must recommend that Bridget drop whatever she is readying and pick up Gayle Foreman. Do it!! If I Stay and Where She Went are two of the most beautiful YA books I've ever read! Gayle Forman! I need to read him soon too. The books sounds amazing! I have only read two of those authors..so many authors so little time..lol. Jodi Picoult deals with controversial/taboo topics and creates stories around them. Some are sad, most are heavy. If you are looking for an unusual place to start, try The Storyteller, her newest. It is VERY different from her others and truly beautiful. Nice list! I LOVE the If I Stay duology, they´re one of my favorites books. I love the lists here! You need to read Cassandra Clare. I know a lot of people think that it's mediocre at best but I love the characters and the setting. Shadowhunters are awesome. I am guilty of a couple of these as well! I just read my first John Green this year, and I am glad I finally did. I have not read any Deb Caletti or Cassandra Clare, though. I hope to change that eventually! I'm not the only one who hasn't read John Green! Makes me feel better. Sadly, John Green is on my list too. 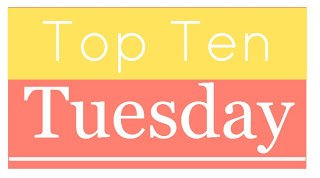 I'm finally able to resume my participation in Top Ten Tuesdays!! :) I've missed making the lists and have been trying for a few weeks to settle back into the meme! I wasn't even sure if I should make a list this week, as I am embarking on reading soo many authors I've wanted to read for such a long time -- therefore, I added a few I'm attempting to read this year with a heap I know I will not get too as well! :) Eager to make my rounds and see what everyone else has listed! Out of your combined lists, John Grisham I do highly recom'd as I read him whilst I was a teenager, and ironically that was 20 years ago! :O Laughs. I loved his ability to convey strong emotional ties between his characters and his readers! Top marks from me on his behalf! I'd not recom'd starting with "A Time to Kill" as I did regret that that was my 'first' Grisham; I'd opt instead to suggest "The Pelican Brief" which is my absolute favourite by far outside of "The Client"!! :) Equally both motion pictures were well enjoyed -- read the books first though! Tahleen never had to read SE Hinton for school? I'm not sure if I had to read it, or just picked them up on my own. I wouldn't worry too much about Cassandra Clare. Her books are good but not life altering.